The promise of great sound, the ability to charge and sync your iPhone or iPod with your computer and a built-in mic for calls make the Audyssey Audio Dock: South of Market Edition a compelling package. Audyssey has been in the audio business for years, designing technology for cars, theaters and home entertainment system. And Audyssey claims they can generate superior sound, even from a small 5- by 9- by 9-inch dock. The secret sauce: inside the dock there are a pair of four-inch woofers and a pair of ¾-inch tweeters that are bi-amplified, like professional studio speakers, and benefit from Audyssey’s audio processing technology. Bluetooth lets you stream music from any Bluetooth-enabled device. 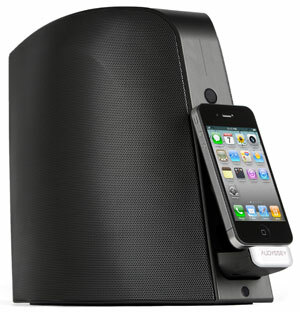 And with microphones mounted in the front and back, the dock also serves as a high-quality speakerphone. The Audyssey Audio Dock also connects to any Mac or PC to stream audio, sync to iTunes, charge the iPhone or iPod and make VoIP calls through services like Skype. The Audyssey Audio Dock: South of Market Edition costs $399 and will ship in November.